Just a quick caveat before we begin. This article was written before .NET Core 2.0 was RTM’d (it was still in Preview 2 when I wrote this article). Almost everything is the same, but some of the screenshots and code snippets make it obvious that I’d written the article with a 1.x code base. Again, the process is the same. Just remember to include version 2.0 of theMicrosoft.Extensions.Configuration.UserSecrets package. We’ve all been there: added some functionality which talks to an external API which requires a secret key, hit commit, then days later wondered why out secret key is being used to authorise applications we didn’t write. in fact, Github have a page devoted to showing developers how to remove sensitive (passwords, api keys, etc.) from their commit history. It’s a big issue, as you can see. It’s all too easy to accidentally commit sensitive information to a repository. Which is where User Secrets comes in. If you work on open source stuff (even if you work on closed source stuff), you don’t want to be storing sensitive information in configuration files. Especially if they are stored on disk in plain text. If some nefarious person gains access to the server that the source code is stored on, then they have access to all of your sensitive information. Granted, if someone gets access to the server then you have slightly bigger issues than just your application’s sensitive information. Unless it’s open source, in which case anyone can search for said sensitive information right there in your code base. Hopefully the folks who have had to issue those commits have changed the passwords and api keys that they were using, but that doesn’t always happen. Anyway, what does user secrets have to do with source control? 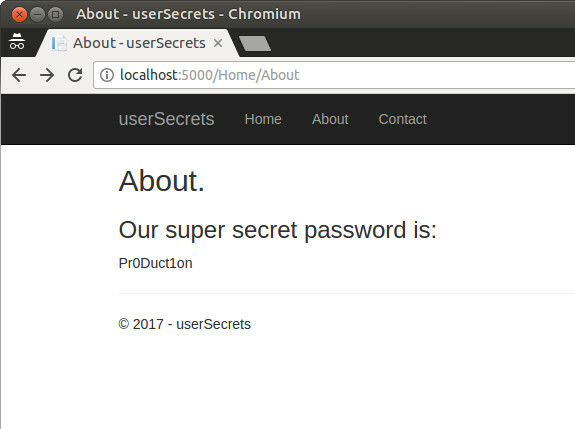 User Secrets are specific pieces of sensitive information which need to be kept out of source control: api keys, connection strings, administrator passwords, etc. User secrets aren’t new to .NET Core, it was first committed to the ASPNET repository in March 25th 2015 and moved to the Configuration repository in September of 2016.
the glory of open source, eh? 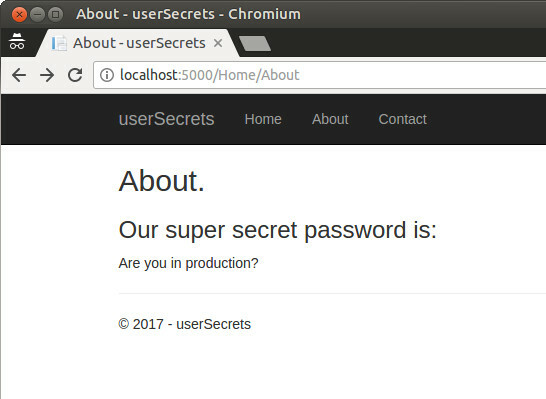 The whole point of User Secrets is that developers can store their sensitive data for the application they’re working on (passwords, api keys, connection strings, etc.) in a file separate from the code tree. This means that they cannot be accidentally committed into source control. Developers use a command line tool (or a tool within Visual Studio) called the Secret Manager to add secrets for a specific application to a directory which is semantically different (and far away) from where the source code is being written. 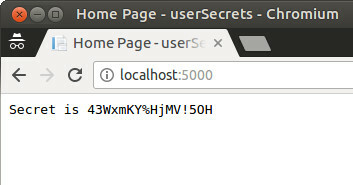 Secrets are then added to a sub-directory within the developer’s home directory. A hidden directory is added to the developer’s home directory called .microsoft and a sub-directory is added to that called usersecrets. Within this directory, sub-directories for all application projects with user secrets are created. this is done by the secret manager tool; we’ll see how in a moment. Within each application secrets directory, a file called secrets.json is stored. Any secrets added to a project via the secret manager tool will be added to this file. The Secret Manager tool is used only in development. You can safeguard Azure test and production secrets with the Microsoft Azure Key Vault configuration provider. For staging and production, you can use the Microsoft Azure Key Vault or appsettings.Staging.json and appsettings.Production.json files. These can be generated or supplied to your build system, and pushed to the server. As with almost everything else I’ve written about, we’re going to build an example application to show off the usage of User Secrets. everything’s easier to learn with an example, right? We’ll leverage the built in MVC template, add a user secret to it and consume it while running in development. We’ll then run the application in staging and production to see how the same code can be used to load our sensitive configuration data while in those environments. 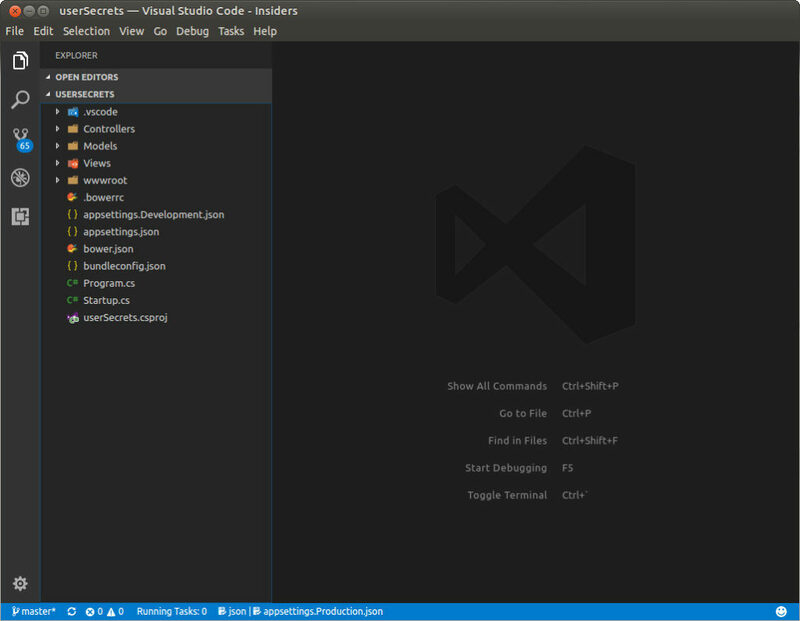 I do everything with VSCode and the terminal, but I’ll include a section for adding user secrets from within Visual Studio 2017, too. As a side note: I tend to add the command line tools to a separate section in my csproj, but feel free to add them where ever you feel works best for you. No executable found matching command "dotnet-user-secrets"
--id The user secret id to use. This is because we have to escape the bang character in order to save it. In Visual Studio, there is a User Secrets Manager which is accessed by right clicking on the project (which represents the csproj) that you want to add secrets for, and selecting Manage User Secrets. Then it’s a case of typing your secrets manually and saving the file. I touched on this earlier, but I feel like covering it again. Here we’ve added the relevant namespaces. Here we’ve added a string to hold our user secret and we’ve instructed the application builder to add the user secrets configuration to our application (we’ll consume it in a moment). Here we’re telling our application to go get the value of SuperSecretPassword from the configuration dictionary (our user secrets have already been loaded into memory by this point) and store it in our string from earlier. Here is where we’re consuming the value of our UserSecrets. We’re creating a response which contains that value of our loaded UserSecret. Which proves that the user secret couldn’t be found. But why? Ah. 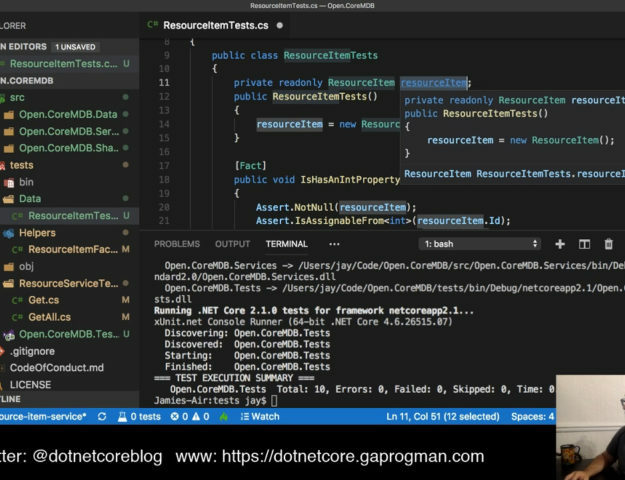 Since we didn’t explicitly state which environment we’re in, .NET Core started in Production. And this make sense, if you think about it. We shouldn’t have to supply a separate command line argument to start the application in production, otherwise starting the application on the server would be more complex. This is a permanent, system-wide, change, though. So don’t be surprised if your other applications start behaving differently. All of that is all well and good, but how do we consume the contents of our User Secrets in a Controller (or some other) method? It turns out that it’s quite easy to do. Since our example User Secrets are pretty simple we only need a simple model. So our POCO just needs to match that. If we add more things to the User Secrets, we’ll need to add them to this POCO. Here we’re telling the IServiceCollection to take the contents of the UserSecrets configuration and deserialise it to an instance of the Secrets class we just reated. There’s some proper ace magic here, in that .NET Core will only deserialise keys which are in both the User Secrets file and the POCO that we’re deserialising to. If, for instance we added a key to the User Secrets which wasn’t present in the POCO, then .NET Core wont raise an error, it will just ignore it. Since we’ve added an instance of the Secrets class to the IServicesCollection in the startup class, we don’t need to do very much to consume it in a controller (or anywhere else within the application). We’ll leverage .NET Core’s built in dependency injection to ensure that it gets added to our controller, then consume it. Let’s use the HomeController’s About method as our example, since it already exists and it’ll be faster to wire it up.
? "Are you in production?" 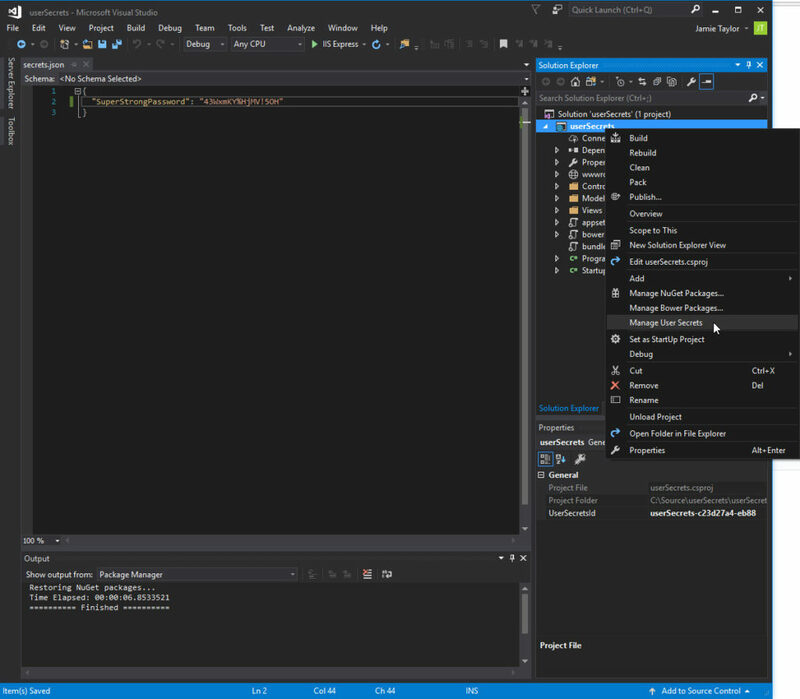 Here we’re using .NET Core’s built in dependency injection to make sure that we get our Secrets class, which was populated in the startup class. Here we’re consuming our Secrets class. We’re already reading an appsettings.Production.json file (if present) and attempting to deserialise a relevant part of it to an instance of the Secrets class. Do exactly the same as above, but create an appsettings.Staging.json file. Again, you’ll want to either have these files already on your production server, or generated by the build action. You are using a build server, right? It’ super easy to set something like AppVeyor up specifically for this. 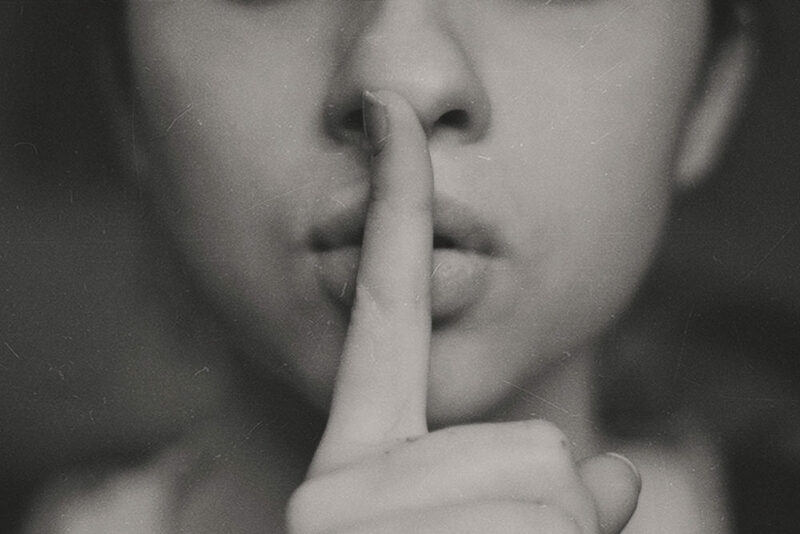 We’ve seen the problem that User Secrets were designed to solve, how to create them, and how to consume them in your application. We’ve also seen how appsettings should be used in place of UserSecrets when outside of development (i.e. in Staging and Production). 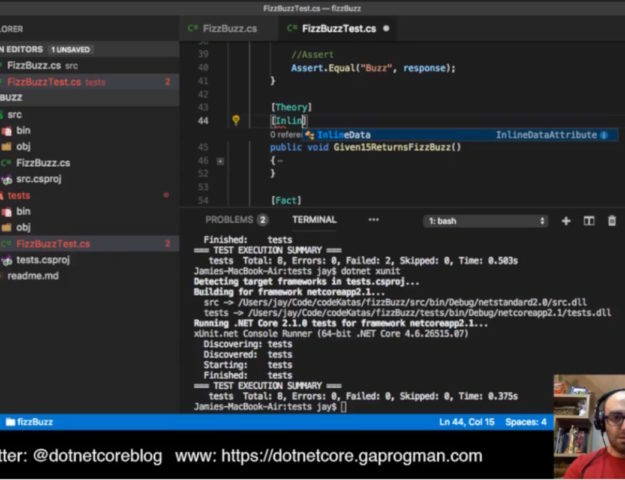 We’ve also seen that .NET Core does all of the hard work of figuring out which files to deserialise, in which situations. 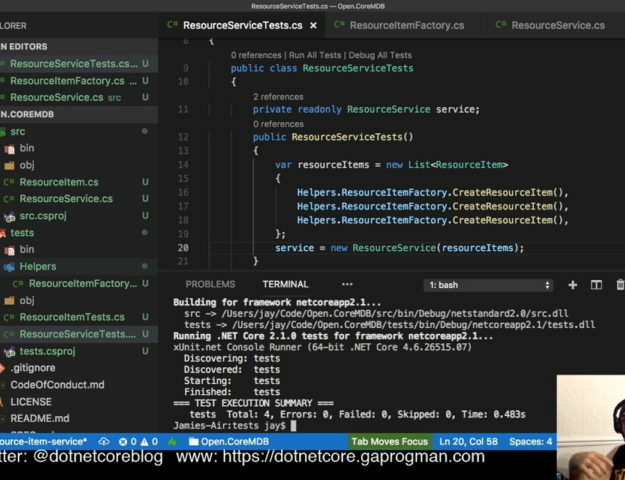 Have you used User Secrets in any of your .NET Core applications yet? If so, what did you think of them? Did they seem as amazing and magical to you as they did to me? If you haven’t used them would you be more willing to use them now that you’ve seen how to do it? Let me know in the comments and let’s keep the conversation going.